Something new and different is being introduced to the Nissan lineup. It is as interesting a selection as it is odd. 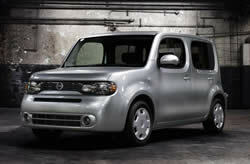 The Nissan Cube has finally made its debut in the United States after only being sold in foreign countries for many years. My impression of this car was very different before the test drive, than it was after. Before, I thought it would not have a smooth ride or enough pick up to pass cars on the expressway. However, my opinions were altered after the test drive, in a good way. Let’s talk about the drive. One thing that propels this vehicle forward with ease is the 1.8 Liter 122 Horsepower engine, which combined with the CVT transmission, is a good fit for its box like frame. The acceleration was just as surprising as it clocked a 0-60 time in 11 seconds. The Cube also gets very good gas mileage with 30 MPG highway. The braking was smooth as the acceleration. It stopped in a respectable distance and there was no pulsing in the brakes, which sometimes can give a jerky feel when the brakes are applied. Even in hard braking situations, the Cube was remarkably smooth. The handling was also remarkable, as it hugged corners tightly without losing traction, which was partly thanks to the suspension. The Nissan Cube comes equipped with an independent front strut suspension with stabilizer bar, and torsion beam rear suspension with integrated stabilizer bar. With this suspension, excessive body roll was minimized when the vehicle was pushed to its handling limits. One negative thing I observed while driving the Cube was the wind noise. Although bearable, I noticed that at highway speeds the wind noise was more noticeable then at lower speeds. In the interior of the Cube, their were plenty of very impressive features including automatic temperature control, with a large digital display, and a Rockford Fosgate stereo system with 6-speakers playing your favorite tunes and more. One interesting feature about the radio was the option of selecting a function that automatically adjusts the volume depending on the noise level in the cabin. The Cube also comes available with push button start, which means you can start the car without having to pull out your keys. The intelligent key makes operating the Cube simple. The leather wrapped steering wheel and volume controls add extra convenience and luxury. Also, this is a great road trip car for anyone who wants to ride in comfort. The rear bench seat reclines, which allows the passengers to relax as if they were in a lazy boy recliner. Something lacking in this Cube, however, is the truck capacity. You could barely fit suitcases, let alone groceries in the trunk. However, the rear legroom is good. From a design aspect, the interior has very interesting waves and curves. If you look to the ceiling of the Cube, you will notice the ripple effect of that appears to be similar to waves in the water. This concept also carries over to the design of the speakers. The dashboard is also curvy, and the gauges are easy to read and are within close proximity to the driver. The chrome door handles blend well, which complements the rest of the interior. Something that we might agree on is its odd shape. It is really boxy and weird looking. But, it does offer some appealing features on the exterior. To name a few, there are the 16-inch aluminum alloy wheels, body colored mirrors, rear privacy glass, and automatic halogen headlights. The Nissan Cube definitely has you covered in the safety department. It comes equipped with 6-standard airbags, which include front seat mounted side-impact supplemental airbags, roof mounted curtain airbags, and front driver and passenger airbags, which keep all of the passengers safe in the event of a crash. Other safety features that will give you peace of mind, is the Vehicle Dynamic Control (VDC), which always monitors steering and braking. When the vehicle starts to loose control, this system will correct the situation by reducing engine power, or apply a certain amount of brake pressure to the wheels to maintain control. Another safety mechanism is the Traction Control System (TCS), The TCS will make sure that you have plenty of grip in the event that the wheels begin to lose traction or slip. With this device, traction is applied giving the driver more control in all types of conditions. Other important safety features are anti-lock brakes and Electronic Brake force Distribution (EBD) that sends extra force to the rear brakes when the back seat is full or when you have filled up the tank with gas. Brake assist is also an added bonus, which automatically applies maximum brake pressure when the vehicle detects emergency braking. Something that might give you peace of mind is the tire pressure monitoring system, which automatically senses if the tire pressure is low. Overall, it will take some time before we can officially determine how this vehicle will stand up against its competitors. But, I will say that it will be a strong contender to compete with the Kia Soul, which also has a similar boxy appearance.